With simple operation and rapid response time, PMB moisture analyzers offer the top value in their class. A single 400-watt halogen bulb heats samples in 1 °C selectable increments. Three heating options give users the flexibility to customize test methods and temperatures for different materials. The automatic test-setting function enables easy recall for frequent testing of the same items without additional user programming. USB and RS-232 interfaces provide computer and printer connections to store test programs and results. No additional software is needed to take readings, giving users total freedom to collect data on a production floor or in the field. The PMB can be used to accurately determine the moisture content in food samples, oils and creams. Suitable for cosmetics, agriculture, food testing and science laboratories. For more information on the PMB moisture analyzer, please contact us. The winemaking process comprises many steps, from the vineyard to the bottle. Moisture analysis can help vintners optimize their harvest and achieve the best product. You might have seen moisture analyzers on websites that sell scales and balances. What is a moisture analyzer? What does it do? And how does it relate to balances and scales? How do you calibrate a moisture analyzer? We answer these questions and more in this post about moisture analyzers. The Adam Equipment PMB moisture analyzer provides a rapid alternative to oven testing, which is time-consuming and inefficient. 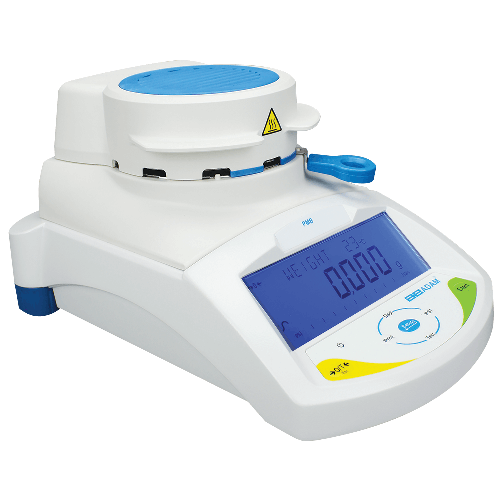 A moisture analyzer, also known as a moisture balance, does the job in a fraction of the time, providing reliable and consistent results.The PMB not only speeds up the drying process, it eliminates the possibility of burning a sample and getting false results. The sample is placed in the PMB moisture analyzer and the balance captures the initial weight. A single 400-watt halogen bulb heats samples in 1 °C selectable increments. While the sample is heating, the PMB records the changing weight. After evaporating the moisture, the heat shuts off and the PMB calculates the weight of the moisture that has been lost, responding with the moisture content. While water is an essential ingredient in many commercial food products, too little or too much can pose safety and quality issues. That’s why food testing labs rely heavily on moisture analysis during the initial product research and development phase, and later on in quality control checks. Maintaining the correct moisture levels is critical for safe food products, and also when determining product shelf life and expiration dates to help ensure food freshness, flavor and stability. Grape pressing is one of the more important parts of winemaking. How and when it’s done can affect the flavor of the finished product and can play an important role in producing a higher yield. Moisture content determination is an essential part of the winemaking process, with vintners wanting to ensure maximum yield from the grapes, increase production efficiency, and boost profitability. Once water has been used, whether for washing laundry or dishes, for bathing or using the toilet, it becomes dirty and is called wastewater. Before wastewater can be used again, it must undergo a rigorous cleaning and sanitizing process at a water treatment facility. An accurate moisture analyser or moisture balance provides wastewater testing labs with valuable information throughout the treatment process, helping save money and improving the efficiency of the entire procedure. It takes 10 tons of sand to make one ton of glass, and the amount of moisture in the sand must be just right. Too little moisture means more sand is needed, which increases manufacturing costs. Too much moisture can lower productivity and cause quality issues. Glass manufacturers rely on moisture analyzers to verify and maintain proper moisture levels in sand supplies. Moisture analyzers provide a speedy alternative to oven testing, making it simple to control the amount of sand used in each batch of glass. Plastic production companies rely on moisture analyzers to test the moisture content of their products. Moisture analysis provides a fast, easy method to determine if any moisture bubbles formed during production, compromising the integrity of the final product. Plastics (and rubber) with too much moisture may be too soft for purpose, but too little moisture and the plastic may be too brittle. Pharmaceutical excipients are inactive ingredients in medications that provide flavor, color, coating or filler. They play important roles not only in the appearance, taste, texture and consistency of drugs, but also in the release rate and absorption speed of the medicine once it enters the body. As part of quality control during the processing phase, excipients must undergo testing and approval. Moisture analysis provides important information about the moisture content in various excipients.